What’s the best deal you’ve ever gotten? Have you scored 50% off groceries or 80% off a new pair of jeans? Have you ever left the check-out lane with more money than you had when you came in? Getting something for well below the retail price — well below what everyone else is going to pay for it — is a simple and exhilarating victory. You deserve that extra pep in your step as you walk back through the parking lot. But what did you have to do to earn that discount? If you’re like most people, you probably had to wait for a rare sale, battle crazy crowds or diligently scour grocery ads every week. Put the scissors down. Sleep in. Relax. You’re still going to save money. In this guide, we’re going to teach you how to use deal-stacking to get the best price every time you shop — no matter what you’re shopping for. It might sound like something straight out of an episode of Extreme Couponers, but deal-stacking is much simpler — and way less kooky — than you think. Deal-stacking is simply applying multiple discounts to one item or purchase to successively drive down the price. Picture a price tag. Then picture yourself placing a coupon on top of that price tag. Now picture yourself placing a mail-in rebate on top of that coupon on top of that price tag. That’s what deal-stacking is: a little pile of deals and discounts you use to reduce the price of the things you buy. Most of the time, though, you don’t have to actually clip coupons or fill out rebate forms. The best deals happen when you shop online. 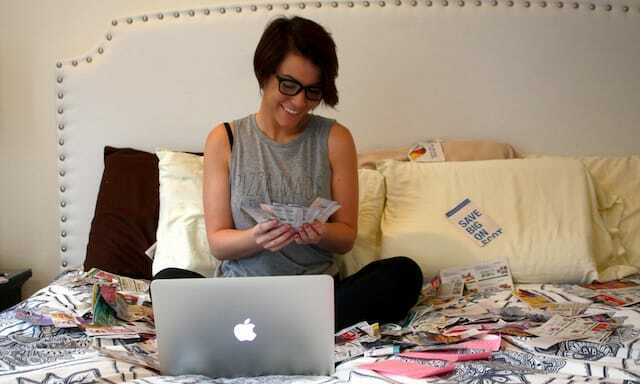 Are you still afraid this is some kind of crazy couponing nightmare? Not convinced it’s worth your time? We used deal stacking to get a $10 Barbie for $4.39. We used it to make an awesome Old Navy sale even better, saving 48%. We used it to get a $35 dress at Target for $7.54. With the tools we’ll give you below, you’ll be able to find deals like this in just a few minutes — without leaving your house. This post is packed with information and resources, so we recommend bookmarking it to help you remember the steps each time you shop. Make a list every time you shop to prevent overspending on impulse buys. Stores — in person and online — are designed to grab your attention as soon as you walk in the (virtual) door and direct it toward whatever you didn’t plan to buy. If you’ve already made a budget, then you know how much you can afford to spend each time you head to the store. Creating a shopping list helps you stick to that budget and ignore distractions. In addition to knowing what you want, decide where to buy everything on your list. Planning ahead is key to getting the best deal. Before choosing a store, use PriceGrabber.com to compare prices on the items on your list. The site will allow you to see a list of online retailers that carry an item. Prices are side-by-side, so you can quickly pick out which has the best offer. You can also receive a discount on items you buy regularly, like toilet paper, certain foods, diapers or beauty products, by purchasing on a schedule through a service like Amazon’s Subscribe & Save or a Target Subscription. Finding the best deals can be tough if you don’t want to spend hours each day glued to your computer or grocery ads. That’s why we love deal aggregators. We also recommend subscribing via email to your favorite stores. You’ll be the first to know about sales and receive exclusive coupons and offers. In addition to finding the best prices, you might be able to save even more by stacking coupons on top of deals. Many coupons exclude items that are already discounted, or can’t be used with any other deals or specials. But you can often use a manufacturer’s coupon with a store coupon, for example. It’s always worth checking! Make sure you read the fine print before you start shopping so you know which coupons are applicable. Whether you’re shopping for the week’s groceries, back-to-school clothes or just indulging, we recommend shopping online whenever possible. Anytime you shop online, you can take advantage of cash-back sites. That means you earn back some of the money you spend on every purchase — you’ll either earn direct cash or points to redeem for gift cards to top retailers. Even better, through Cashbackholic and CostShredder, you can find out which cash-back site offers the best rewards for the store you’re shopping at. The CouponCabin Sidekick browser extension can also help alert you when there’s cash back available for your purchase. As a bonus, you can “recycle” your savings by using the gift cards you earn through these sites on your next shopping “trip.” Earn more points from the money you spend, cash out for more gift cards … do you see how the savings start to stack up? Don’t let shipping costs ruin all your hard work. An extra $5 or $10 to get everything to your door could negate everything you’ve just saved! Often the best way to save money on shipping is to pick up your order in the store. This also saves you from waiting a few days or weeks to have items delivered to your house. For items like groceries that you’d normally buy at a nearby store, this is pretty simple. Just shop online, and select “pick up in store” under your shipping options. Many stores offer pick-up for groceries within a few hours of your online order. For other retail items, you’ll probably have to wait for standard delivery, even if you have them shipped to the store for free. We’ve rounded up 17 stores that offer free shipping — including some retail giants like Target, Dell and Nordstrom. If you buy individual small items on Amazon — lighter than 8 ounces, smaller than 9 x 6 x 2 inches and less than $10 — you can get free shipping, even without a Prime membership. If you’re not a Prime member but want free shipping on larger items from Amazon, use this trick. Choose how you pay carefully. It could be a valuable decision. Whether you have a store credit card could factor into which store is the best deal for the items on your list. What kind of bonuses or rewards will you get if you pay with a store’s branded credit card? Kohl’s Charge Card: You won’t collect points per purchase with this card, but you’ll get at least 12 coupons for discounts of 15-30% every year. Best Buy Credit Card: Choose between 5% cash back or promotional financing. Also receive free shipping on orders of $35 or more, plus exclusive discounts, special sales and members-only events. Walmart Credit Card: This is one of the easiest store credit cards to be approved for, and comes with perks like receiving a free monthly FICO score and cash withdrawals in store with no fees or interest. It can be useful if you’re working to build or fix your credit. Knowing your shopping habits and planning ahead can help you save money for lots of reasons. One of our favorites is it gives you time to get your hands on some discounted gift cards. Visit Raise to purchase gift cards for stores you frequent. Sellers typically unload cards they got as gifts or ones they’re not interested in anymore, so you’ll pay less than the value of the card — giving you an automatic discount on anything you buy with it! Load up on cards from popular stores like Target, Best Buy or Amazon to save money on your everyday purchases. Keep them organized with Gyft, so they’re easily accessible when you’re ready to pay. CostShredder can help you find the sites offering the best deal on the gift cards you’re looking for. If you’re looking for a passive way to earn some money throughout the year, a cash-back credit card is perhaps one of the easiest methods. You just have to be sure you don’t get too carried away with those purchases — and that the card is paid off at the end of each billing period. Here’s an option we like: It’s the Chase Freedom Unlimited card. Its claim to fame? You’ll earn an unlimited 1.5% cash back on all your purchases. Plus, if you spend $500 in your first three months of opening the card (hi, groceries), you’ll pocket a $150 bonus. Get signed up — and 0% intro APR for 15 months — here. *Annual Rewards amounts will change based on the amounts you enter. The monthly spending category names and definitions may vary among issuers, and categories may not align one-to-one. The information for the Chase Freedom Unlimited card has been collected independently by The Penny Hoarder. Opinions expressed here are the author’s alone, not those of the credit card issuer, and have not been reviewed, approved or otherwise endorsed by the credit card issuer. The Penny Hoarder is a partner of Credible. When you pay with a credit or debit card, make your purchase do double duty by connecting the card with an auto-savings app — our favorite is Acorns. When you make a purchase with a card connected to the app, Acorns will automatically round up to the next dollar and deposit the “digital change” into your Acorns account. Then it invests the money into super-simple portfolios to help your money grow. It’s a cool way to make a little extra money while you shop — you probably won’t miss that loose change anyway, so why not put it to work? Once you have your items home, open your Ibotta and Checkout51 apps to find additional rebates for anything you purchased. These apps are popular for the incredible savings they offer on groceries, but you can find deals on other retail items, as well. Check for cash back on all your purchases, including online orders you have delivered, and remember to enter the items when they arrive. Even if you don’t find a rebate for your particular items, you could still earn money just by taking a picture of your receipt with another cool app we’ve found. Receipt Pal literally lets you earn rewards just for snapping a photo of your receipt — regardless of what you buy. When you take a picture of a receipt, Receipt Pal will reward you with points you can redeem for gift cards. Your receipt data is used anonymously with others’ for market research. You may have to wait as the app staggers in participants for their consumer panels. All you have to do is download the app and register with your email address, and you’ll be notified when it’s accepting new users. Dana Sitar (@danasitar) is a staff writer at The Penny Hoarder. She’s written for Huffington Post, Entrepreneur.com, Writer’s Digest and more. 42 Minutes Ago Dear Penny: I Can Only Afford Interest on My Student Loans. What Can I Do?